I love this movie. 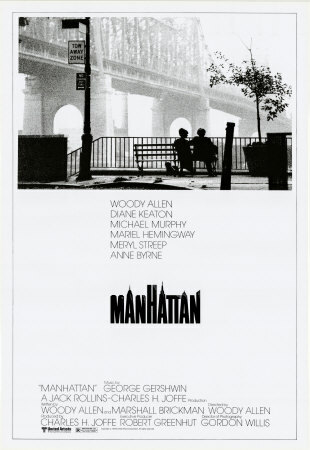 I think Woody Allen is typically thought of as a writer first and foremost, but Manhattan is most definitely a director's movie and proves that he should be thought of in the same terms as Scorsese, Coppola, and other celebrated contemporary directors. Thanks for sharing your love for this film. Well, I'd say I'd have to go with the viewpoint that, the best aspects of Woody Allen that in movies like Annie Hall & Manhattan lie in his scripts. But then, that certainly do not reduce his capability as a director. He certainly ranks alongside Scorsese & Coppola as one of the great American auteurs. Thanks Neetu. I'm sure you'll love it too. One of Allen's best and a love song to NYC, at least to Allen's romantic Upper West Side/Upper East Side version of NYC. The photography is exquisite. I happen to like B&W film a lot, it is more abtract to start with, and lighting wise you can practically paint with it creating multiple moods and images in shadow and light. Another fine review Shubhajit! Thanks a lot John. Yeah, the B/W photography has a transformative effect on the viewers, and it really grows onto you right from the lovely vignettes of NYC that the film starts with. And since I'm already aware, from your various blog posts, of the kind of love that you too have for the city, I sure can appreciate how much the movie means to you. Aye, Shubhajit, it's one on a short list of quintessential Manhattan films, and it's certainly it's director's homage to his beloved city, and perhaps his greatest work, in a close call with ANNIE HALL. Gorwon Willis' widescreen black and white cinematography is a model of its kind, and the screenplay shows the master at the top of his game. Yes indeed, there is a marked melancholy and nostalgic essence here, and a wistfulness sinular in his work. Marvelous, astute essay here! Thanks a lot Sam. I'm finding it increasingly difficult to decide which of the two among Annie Hall & Manhattan I liked more. The former was a bit more cerebral & witty, while the latter made that up through a dose of melancholy. The B/W photography bowled me over, and like the hallmark of any great movie, the script was marvelous. Wonderful critique of the film's defining attributes. For me, although it isn't my favourite Woody Allen film, it is his most visually beautiful. I love his use of black and white in the film. Has New York ever looked as good? Thanks Dan. Yeah, this is one of those definitive New York movies. This is really an insightful review. This movie was wonderful. This is extremely informing.